Leading Adoption Law Specialist in the Inland Empire for over 25 years. Founding Member of the Academy of California Adoption Lawyers. 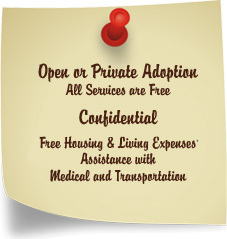 Adoption Choices has specialized in private adoptions for over 33 years in the Inland Empire. If you are dealing with an unplanned or unwanted pregnancy, our caring, experienced office staff and female adoption counselors are available to answer all of your questions. Our staff is here to guide you every step of the way though the simple, yet emotional, adoption process. Every adoption is unique, which is why we handle your situation individually. If you decide to pursue adoption a counselor will be assigned to yur case throughout the process. We offer comprehensive birth mother assistance at no cost and everything will be handled confidentially. On a personal note, our staff has experience with all sides of adoption. Attorney George Maricic began his practice as a result of his choice to become an adoptive parent. Nearly all of our staff members have adopted or have been involved in the adoption process in one manner or another. We understand. All Services are Free, Confidential. Free Housing and Living Expenses. Assistance with Medical and Transportation. own counselor throughout the entire adoption.